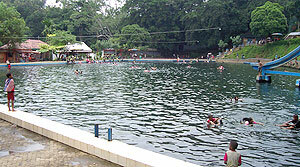 Selokambang swimming pool is about 6km from west of Lumajang. The visitors can enjoy the beautiful, fresh and natural panorama. The society around it believe that the water can be recovered kinds of diseases, for example skin disease, rheumatic, bone disease, etc. The facilities are swimming pool special for adult, children, fishing area and graceful swans. Visit Selokambang swimming pool with your family and enjoy its clear water. You can also do fishing activities and walking around the tourism area.